Specialising in dynamic, virtuosic, and through composed pieces that feature bulletproof tightness and tender lyricism, Smitty's Big Four play what they call "chamber swing". Their sixth-sense ensemble playing is comparable to that of a top notch string quartet or chamber music ensemble. Tonight, they echo the Philharmonia Orchestra's sound across the hall with a smaller, classically tinged program of Gershwin and Bernstein classics. The Big Four are the kid brother of the Kansas Smitty's House Band and were born three years ago in the belly of Waterloo's cavernous vaults. Since its inception the band has taken on a trajectory independent from the House Band's. 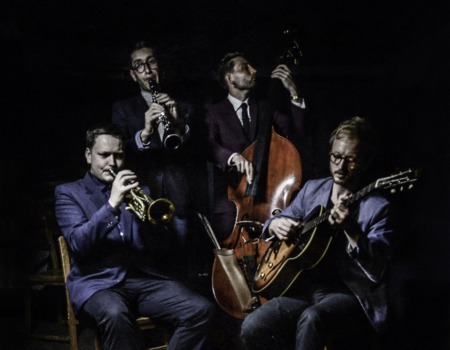 Their infectious beat has raised people up out of their seats from Shoreditch House to The Hackney Empire with small group interpretations of songs by their favourite ragtime and jazz masters: Jelly Roll Morton, Scott Joplin, Sidney Bechet and some Django Reinhardt.